At about this time last year, we went to visit my sister and her family in the town my husband and I went to college in. 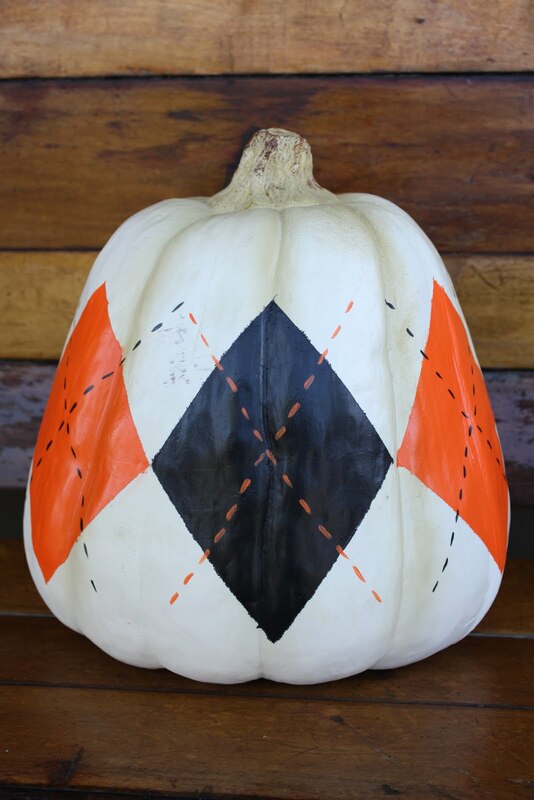 While shopping one evening (because that is pretty much what we spend our time doing when we're together) I saw some adorable faux pumpkins painted with argyle patterns. I wanted to buy them, but they were expensive and very large, too large to fit in a little suitcase. So as soon as I got home, I went to the craft store and bought supplies to make my own argyle pumpkins. 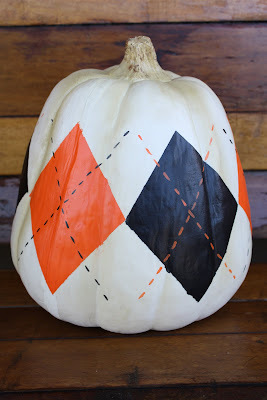 And Halloween came and went without any argyle pumpkins, so I packed all of my supplies away with our decorations and resolved to make them this year. When October 1st rolled around this year, I finally did it! And then I didn't get the post up for two weeks, but here they are, 1 year+ in the making! 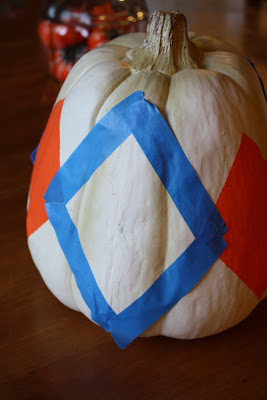 Using the measuring tape, measure the circumference of the pumpkin (Figure out how tall your pumpkin is--minus the stem--and find the middle). Lightly trace it with a pencil. Figure out how many diamonds you want on your pumpkin. It needs to be an even number so that the colors alternate all the way around. Trust me on that one! Take the circumference measurement, divide it by the number of diamonds you want, and you'll get the width of each diamond. 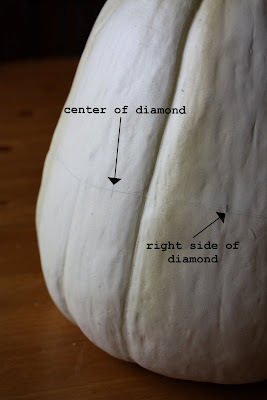 For example, if my pumpkin is 30 inches around and I want 6 diamonds, I divide 30 inches by 6 to get 5 inches. Each diamond will be 5 inches wide. With your measuring tape, start marking off the left and right points of the diamonds. Pick a starting point on that line you drew around the middle and, using the pencil, make a dot that is big enough that you'll be able to find it again. Now make another dot to mark the end of your first diamond and the beginning of your second. 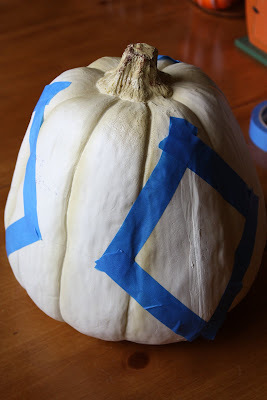 Continue doing this all the way around your pumpkin. Since my diamonds will be 5 inches wide, I pick a starting point, mark it, and then make another dot every 5 inches until I reach my first dot again. Next, make a mark where the middle of each diamond will be. I marked the outside edges of my diamonds with a dot and the middle with a short, vertical line so that I didn't get mixed up. Divide your diamond width by 2 to figure out where the middle of each diamond is. Or eyeball it! Since my diamonds are 5 inches wide, the middle mark goes at 2.5 inches. Now, decide how tall you want your diamonds to be. I think it looks best if the diamonds are taller than they are wide. Take your measuring tape, line it up with that mark you made in the center of your diamond, and make marks where you want the top and bottom of the diamond to be. I want my diamonds to be 7 inches tall, so half of that height needs to be below the center line and half needs to be above. I line my measuring tape up with my center mark and put a pencil dot 3.5 inches below and one 3.5 inches above. 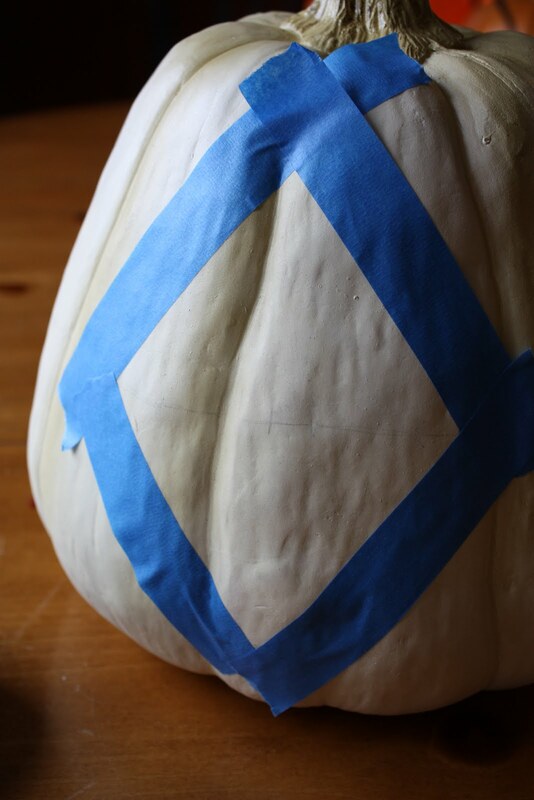 Next, tape off every other diamond with blue painter's tape. You'll need 4 pieces of tape for each diamond: one piece connecting the left dot with the top dot, one piece connecting the top dot with the right dot, one piece connecting the right dot with the bottom dot, and one piece connecting the bottom dot with the left dot. 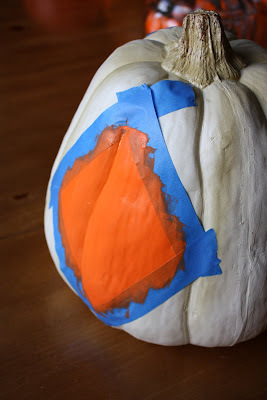 Make sure you follow the surface of the pumpkin with the tape and make a nice, tight seal. Paint your first set of diamonds with one color. Mine took 3 coats of paint, and I used a 1 inch-wide sponge brush. Let the paint completely dry and then remove the tape. Using the same technique, tape off and paint the other diamonds using your second color. Using a fine-tipped paint brush and the opposite color, paint a large, dotted X through the middle of each diamond. Let it dry. Spray everything with a clear acrylic sealer. These are really cute! I may have to try! 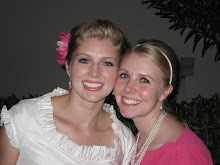 We are no longer blogging here on Max and Ellie. If you'd like to see what projects we've been working on lately, come visit us at Lulu the Baker! !